Ever had one of those moments that the apostle Paul talks about in Ephesians 3:20? A moment where God shows us that He is able to do far more abundantly beyond all that we ask or think, according to the power that works within us? KiDs Beach Club® experienced one of those days last Thursday on North Texas Giving Day. From 6 a.m. until midnight, 116 people provided a gift and joined our mission to connect kids to Jesus Christ and put Bibles in their hands. Our generous friends provided nearly $26,000, which we praise God for. The part of God doing something more abundantly beyond all we ask or think came during the last four hours of North Texas Giving Day in a radio studio in downtown Dallas. 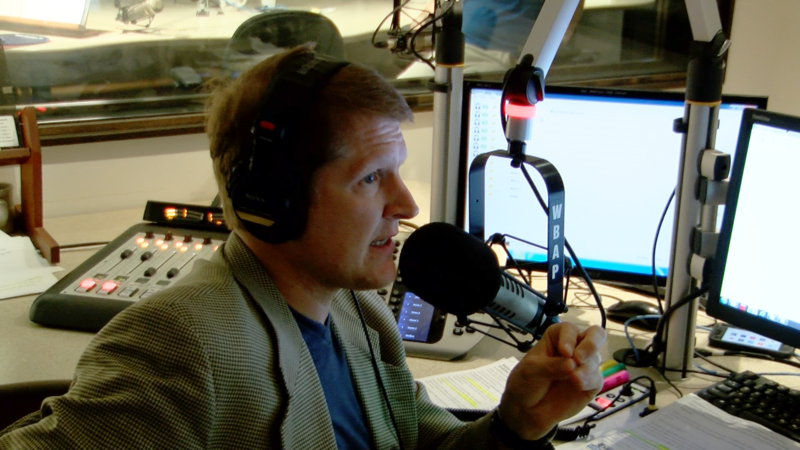 Chris Krok, who hosts a talk show every weeknight between 8 p.m. and midnight on WBAP 820 AM, saw the state of affairs in our country and decided that enough was enough. The lawlessness of the night included riots after a police shooting in Charlotte, N.C and even protests through the streets of Dallas. For four straight hours, he repeatedly asked his listeners to give donations with the numbers of WBAP’s frequency, 820, to help track the impact this audience can make. Within the first hour, donations came in for $820, $82, $28.20 and $8.20 and after the show ended, more than 30 donors contributed in excess of $3,500. The dollar amount shows an amazing measurable impact but the immeasurable impact will take place in the days to come. During Krok’s program, WBAP, a 50,000-watt clear-channel radio station, has a signal that blasts into 38 states. Krok, who was the keynote speaker at the KiDs Beach Club® Bibles For Beach Club Benefit Dinner and Auction this past April, educated his vast audience for four straight hours about how 62 percent of the children who attend a Beach Club don’t have a church home and how getting God’s word into their hands during Beach Clubs will change the culture of America. One day later, a local politician who was listening to the show, called the KiDs Beach Club® corporate office wanting information about getting Beach Clubs in the elementary schools in his town and vowed to encourage other politicians to do the same. Please join us in prayer that this seed that Krok spread about KiDs Beach Club® landed in good soil and will result in thousands more children hearing the word of God in many new Beach Clubs around America. As Jesus mentioned in His parable in Matthew 13:3-9, the seed that lands in good soil “yielded a crop, some a hundredfold, some sixty, and some thirty. He who has ears, let him hear.” Many heard Krok last Thursday talking about KiDs Beach Club®, Teaching KiDs Truth, and we praise God for his provision and incredible answer to prayer.